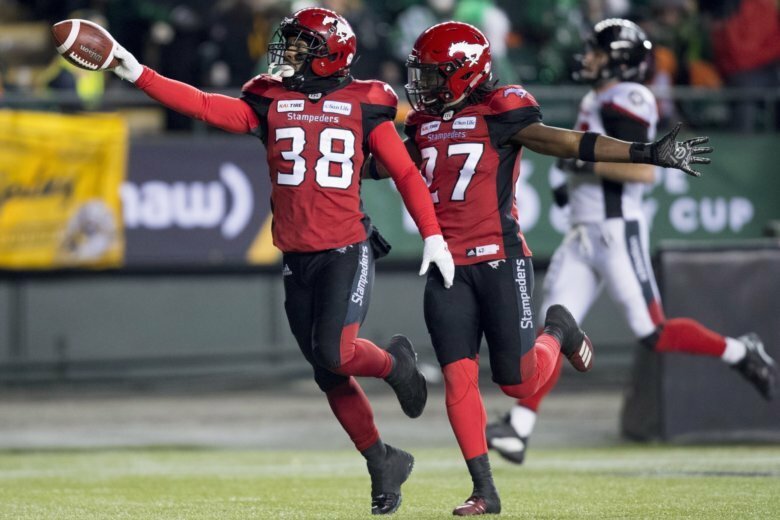 EDMONTON, Alberta (AP) — Terry Williams and Bo Levi Mitchell helped the Calgary Stampeders end their Grey Cup misery. Williams had a Grey Cup-record 97-yard punt return for a touchdown and Calgary beat the Ottawa Redblacks 27-16 on Sunday night after falling short the previous two years in the Canadian Football League title game. Calgary lost 39-33 in overtime to Ottawa in 2016, and dropping a 27-24 decision to Toronto last year. The Stampeders won their eighth title and first since 2014. Mitchell — the CFL’s most outstanding player this season after throwing a league-best 35 TD passes — was the game MVP. The former SMU and Eastern Washington star was 24 of 36 passing for 253 yards and two touchdowns, but also had two interceptions. Williams scored on the punt return just before halftime. The former Kutztown running back nearly fell heading upfield on the slippery Commonwealth Stadium turf, but an Ottawa defender engaged with a blocker slid by, allowing Williams to hit the open field, then run past punter Richie Leone to make it 21-11. Stampeders receiver Lemar Durant was selected the outstanding Canadian after making four catches for 30 yards and a TD and adding a 22-yard run. Redblacks quarterback Trevor Harris was 20 of 38 for 288 yards with a touchdown and three interceptions. Ottawa — in its third Grey Cup in four years — appeared to score on Greg Ellingson’s acrobatic one-handed grab in the fourth quarter but replays showed the ball hit the turf. The Redblacks ended up turning the ball over on downs at the Calgary 7 with just over eight minutes remaining. After Ottawa turned the ball over on downs again, Calgary’s Jamar Wall and Tre Roberson followed up with interceptions on consecutive Redblacks possessions. Roberson’s pick came with 1:22 to play.